When searching for a new timber floor, most people are looking for something that is hard wearing, however determination of what this actually means is not as simple as it sounds. To some extent, the subject of timber hardness and ongoing durability of a timber floor is misunderstood, as it’s not the timber itself that is exposed to wear and scratching, but rather the surface coating applied. There are many performance indicators that could be discussed in relation to timber flooring durability, however scratching and denting are generally in the forefront of customers minds when considering the many options available in today’s market. From the thousands of products available, it’s fair to say that all surface coating systems are susceptible to scratching when exposed to abrasive wear. The degree to which a surface treatment could mark or scratch is normally assessed against predictive wear resistance tests, using standardised testing methods. The most common predictive wear test is known as the ‘Taber Test’, which measures the loss in weight of a specific coating film when exposed to an abrasive stone of prescribed coarseness for a specific period. Denting, on the other hand, is related to the density of a particular timber species, with the resulting hardness being classified by an internationally recognised system known as the ‘Janka Hardness Rating’. The Janka rating of a specific timber species is determined by a controlled test, where a steel ball is dropped at pressure onto the surface of various kiln dried samples, with the degree of force required to achieve a specified indentation forming the basis of that timbers ‘Janka Hardness Rating’. The higher the Janka rating, the harder the timber species. In general terms, a medium density timber will have a Janka rating of 4 to 8, whilst a high density timber achieves a rating of 8+. 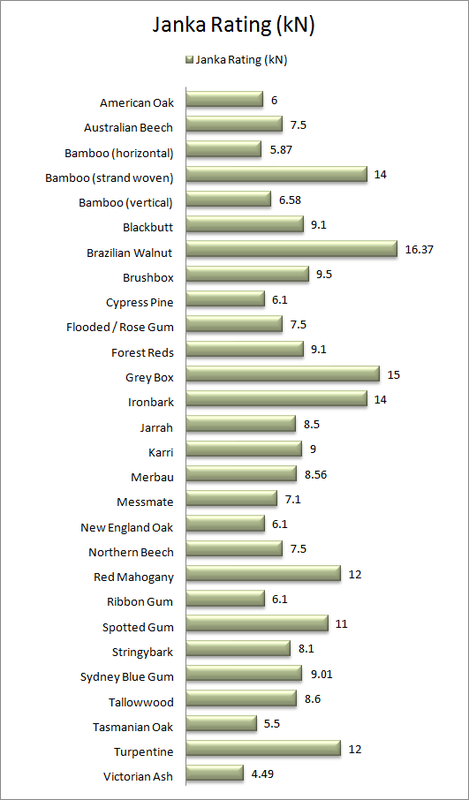 Even though a Janka rating of 8 is considered ‘hard’, many Australian timber species achieve ratings of 12 and above. Potential customers must understand that lifestyle varies significantly between dwellings, and whilst price, colour and appearance are major considerations in the selection process, the number and age of occupants, regular activities and internal footwear habits are important factors when evaluating the options available. If you’re consistently wearing shoes inside the house and/or have young children we’d recommend a denser timber and a harder wearing coating system than if the opposite were to apply. Anecdotal industry evidence indicates that the best post installation performance comes when consumers have discussed and considered their final timber flooring environment before making the decision on what to lay. More detailed information on this topic can be found on the Australian Timber Flooring Association’s website (www.atfa.com.au), with ATFA being the peak regulatory body for the timber flooring industry in Australia. « Coatings: What are the options and what should I choose?